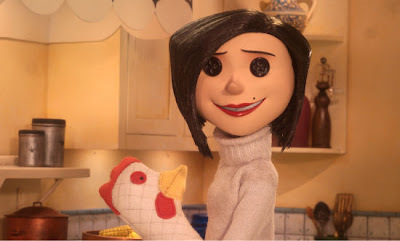 I went and saw Coraline for the 27th time tonight. The theater had me escorted out between my 3rd and 4th viewing when I bought a large tub of popcorn, dumped it out and filled it with butter flavored oil. I guess it wasn't the oil that bothered them, but when I requested a hole saw and a rubbermaid glove, they freaked out. Here is an obviously stolen photo of other mother. I'm gonna buy Miss Sally the chicken oven mitt for her birthday, but it will really be a gift for me.